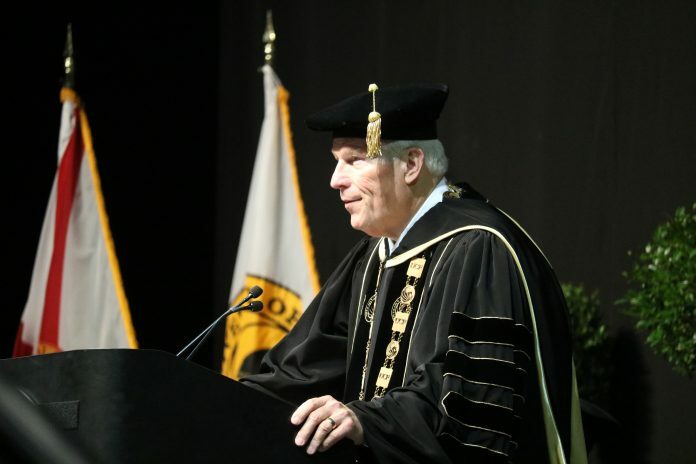 The University of Central Florida community will be invited to the 25th-anniversary celebration and tribute to UCF President John C. Hitt. The ‘milestone’ event will take place on Wednesday, March 1, from 2:00-3:30 p.m. in the Pegasus Ballroom where doors open at 1:30 p.m.
Refreshments will be served during the reception that follows the program. Hitt has received stellar reviews by administrative figures year-over-year. The Board of Trustees, on which Hitt is included, has approved UCF construction and academic expansion projects over the last quarter-century that have changed the face of the campus and image of the university. UCF has also gained national attention through the football program, Limbitless Solutions, and more. “It is a special privilege to serve as president of a university. Society invests in universities not just its money, but something far more precious, the potential of enterprising men and women who seek to enrich their lives through higher education,” Dr. John C. Hitt said in Inaugural Address in 1992.